Oceanfront Grand Pavilion Home! Prime Location! Sports Card, Pavilion Pool Access. 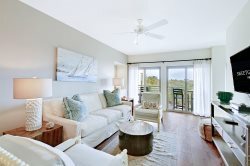 Right in the hustle and bustle of Wild Dunes Resort on the Isle of Palms, this oceanfront home is the perfect spot! 58 Grand Pavilion is a 4 bedroom, 4 bathroom house right in the heart of Wild Dunes and just steps to the Atlantic Ocean. With a classic beach style, the home welcomes you with it’s simple design and family-friendly living space. The living room has immaculate oceanfront views and expansive windows to offer in the direct sunlight. There is plenty of space for everyone to gather around to converse or watch TV. Step out onto the back porch and relax on the outdoor furniture while taking in the breathtaking beach views. The open concept floor plan also opens into the dining with seating available for 8, and the fully-equipped kitchen. The kitchen has everything you need to prepare a delicious meal! The only bedroom available on the first floor has a queen size bed and private bathroom. Head upstairs to the remaining three bedrooms. Down the hall to the left is another queen room with a private bathroom. The middle room has two twin beds and a private bathroom. And lastly the master bedroom sports a king size bed, double closet space and a private bathroom. It also has a private balcony with just as impressive beach views. If you are looking for a home right in the heart of the resort, this is it. We’d love to have you come stay at 58 Grand Pavilion! "Wild Dunes Resort is expanding! With the construction of the new hotel, there may be some distant construction noise audible from this property during normal business hours. It shouldn't impact your ability to relax and enjoy the beach and resort amenities, but we just wanted to make you aware." This property also has a Wild Dunes SportsCard. This is a club membership to be able to access the Wild Dunes Resort amenities. With this pass, there is access to 4 community pools and the resort fitness center. You must pick up your SportsCard at the Sand and Sea Salon on the Village Plaza (hotel area of the resort).